Indian Standard Time is calculated on the basis of 82.5' E longitude, in Mirzapur (Amravati Chauraha), Uttar Pradesh, which is nearly on the corresponding longitude reference line. After independence in 1947, the Indian government established IST as the official time for the whole country, although Kolkata and Mumbai retained their own local time (known as Calcutta Time and Bombay Time) until 1948 and 1955, respectively. The Central observatory was moved from Chennai to a location at Shankargarh Fort in Allahabad district, so that it would be as close to UTC+05:30 as possible. Daylight Saving Time (DST) was used briefly during the China–Indian War of 1962 and the Indo–Pakistani Wars of 1965 and 1971. The country's east–west distance of more than 2,933 kilometres (1,822 mi) covers over 29 degrees of longitude, resulting in the sun rising and setting almost two hours earlier on India's eastern border than in the Rann of Kutch in the far west. Inhabitants of the northeastern states have to advance their clocks with the early sunrise and avoid the extra consumption of energy after daylight hours. In the late 1980s, a team of researchers proposed separating the country into two or three time zones to conserve energy. The binary system that they suggested involved a return to British–era time zones; the recommendations were not adopted. In 2001, the government established a four–member committee under the Ministry of Science and Technology to examine the need for multiple time zones and daylight saving. 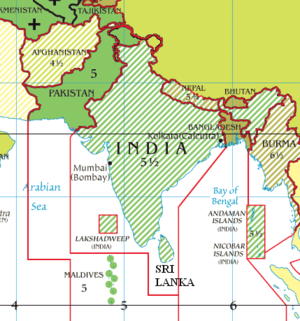 The findings of the committee, which were presented to Parliament in 2004 by the Minister for Science and Technology, Kapil Sibal, did not recommend changes to the unified system, stating that "the prime meridian was chosen with reference to a central station, and that the expanse of the Indian State was not large." Though the government has consistently refused to split the country into multiple time zones, provisions in labour laws such as the Plantations Labour Act, 1951 allow the Central and State governments to define and set the local time for a particular industrial area. In Assam, tea gardens follow a separate time zone, known as the Chaibagaan or Bagan time ('Tea Garden Time'), which is one hour ahead of IST. Still Indian Standard Time remains the only officially used time. The filmmaker Jahnu Barua has been campaigning for a separate time zone (daylight saving time) for the past 25 years. In 2010, he suggested creating a separate time zone for the Development of Northeastern Region. In 2014, Chief Minister of Assam Tarun Gogoi started campaigning for another time zone for Assam and other northeastern states of India. However, the proposal would need to be cleared by the Central Government of India. In June 2017, Department of Science and Technology (DST) indicated that they are once again studying feasibility of two time-zones for India. Proposals for creating an additional Eastern India Time (EIT at UTC+06:00, shifting default IST to UTC+05:00 and Daylight saving (Indian Daylight Time for IST and Eastern India Daylight Time for EIT) starting on 14 April (Ambedkar Jayanti) and ending on 2 October (Gandhi Jayanti) was submitted to DST for consideration. Official time signals are generated by the Time and Frequency Standards Laboratory at the National Physical Laboratory in New Delhi, for both commercial and official use. The signals are based on atomic clocks and are synchronised with the worldwide system of clocks that support the Coordinated Universal Time. Time and frequency calibrations made with the help of pico- and nanoseconds time interval frequency counters and phase recorders. IST is taken as the standard time as it passes through almost the centre of India. To communicate the exact time to the people, the exact time is broadcast over the national All India Radio and Doordarshan television network. Telephone companies have dedicated phone numbers connected to mirror time servers that also relay the precise time. Another increasingly popular means of obtaining the time is through Global Positioning System (GPS) receivers. ^ "Military and Civilian Time Designations". Greenwich Mean Time. Retrieved 2 December 2006. ^ "Two-timing India". Hindustan Times. 4 September 2007. Archived from the original on 9 May 2013. Retrieved 24 September 2012. ^ "Odds and Ends". Indian Railways Fan Club. Retrieved 25 November 2006. ^ "India Time Zones". Greenwich Mean Time. Archived from the original on 19 May 2007. Retrieved 25 November 2006. ^ a b c Sen, Ayanjit (21 August 2001). "India investigates different time zones". BBC News. Retrieved 25 November 2006. ^ S. Muthiah (24 September 2012). "A matter of time". The Hindu. Retrieved 25 November 2006. ^ "Standard Time for Different Regions". Department of Science and Technology. 22 July 2004. Archived from the original on 28 September 2007. Retrieved 25 November 2006. ^ "A matter of time". National Resource Centre for Women. Archived from the original on 19 March 2006. Retrieved 25 November 2006. ^ Rahul Karmakar (24 September 2012). "Change clock to bagantime". Hindustan Times. Archived from the original on 6 June 2011. Retrieved 22 September 2008. ^ "Gogoi for separate time zone for Assam - Times of India". The Times of India. Retrieved 10 May 2018. ^ "India could get second time zone with Assam one hour ahead". ndtv.com. ^ "Government assessing feasibility of different time zones in India". The Economic Times. 22 June 2017. Retrieved 18 August 2017. ^ "Satellites for Navigation". Press Information Bureau, Government of India. Retrieved 25 November 2006.